Home » LinkedIn Toolbox: The LinkedIn Help You Need! LinkedIn Toolbox: The LinkedIn Help You Need! LinkedIn is not just a social network— it is an incredibly powerful SALES tool but learning to use it the right way involves trial and error. You don’t have to spend tons of time figuring it out on your own… you can get the LinkedIn help you need… TODAY! Simply creating an account on LinkedIn is not enough! Why? LinkedIn is your professional network. It’s the place to find opportunities. By logging in once, you are missing the boat! And here’s the issue: Do you even know how to use LinkedIn? Do you know where to even start? That’s where my LinkedIn Toolbox comes in! The LinkedIn Toolbox provides you the LinkedIn help you need to get you up and running FAST! 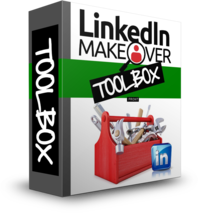 Your LinkedIn Toolbox is everything I needed to leverage LinkedIn more effectively. Everything I could possibly want but just didn’t even know I needed was there… easy to find, easy to use. I am now using LinkedIn more effectively and I have your Toolbox to thank! ith my LinkedIn Toolbox, you will learn how best use LinkedIn to add value, inspire, and align yourself with the right opportunities! Access to ALL my eBooks! ou’ll learn the very best practices for leveraging LinkedIn without experimenting or spending hours and hours searching Google. I’ve spent five years making all of the mistakes, finding all of the tricks and becoming an expert with LinkedIn… so you don’t have to. You could spend your hard-earned evenings and weekends tinkering around with LinkedIn, reading endless blog posts about the best ways to leverage it and eventually figuring it out. Or, you could spend a couple of hours with my LinkedIn Toolbox and you’ll be off and running — optimizing your LinkedIn network the right way. Click the button below to instantly grab your digital LinkedIn Toolbox. Join the others who learned to harness the power of this incredible application in a couple of hours — not days or weeks.